Despite the increasing scholarship devoted to the study of the Templar order, founded in 1119, the mystery surrounding the Templars endures. Secret societies from the Freemasons to the Ordo Templi Orientis claim descent from this religious order of warrior-monks. As the private army of the pope, the Knights Templar were initially established to protect Christian pilgrims traveling to the Holy Land but grew to become one of the most powerful organizations in the Middle Ages. With period illustrations from manuscripts from the Crusades, interpretive romantic paintings from the 18th and 19th centuries, and contemporary photos by Steven Brooke and others of former Templar strongholds in Europe and Jerusalem, James Wasserman, author of the bestselling The Templars and the Assassins, provides a fascinating history of the Order and the many mysteries and legends that surround it. Wasserman presents the evidence for the Templar connection to mystical Islamic organizations such as the Assassins as well as their ties to “heretical” groups such as the Cathars, who were targeted by a crusade in southern France to expunge the challenge they presented to the orthodoxy of their time. In addition to providing an overview of the Templars’ actions during the Crusades, Wasserman revisits the trial and the charges leveled against them, showing how the Order was ruthlessly crushed. He also explores the nature of the treasure they left behind, which has fueled popular imagination for centuries. The Knights Templar, or Poor Knights of the Temple of Solomon, or Poor Fellow-Soldiers of Jesus Christ, were founded by Hughes de Payens, a French knight who had taken religious vows upon the death of his wife. He is known to have been an austere man of deeply held spiritual values, humility, and uncompromising valor. He was nearly fifty when he founded the Order, a veteran of the First Crusade who had spent the previous twenty-two years of his life east of Europe. Two of the most widespread accounts of the Order’s founding agree that in 1118 or 1119, Hughes, along with eight other knights, took vows of obedience to the Patriarch of Jerusalem, resolving to live in holy poverty and chastity, and to devote themselves to the care and protection of Christian pilgrims traveling through the Holy Land. King Baldwin II awarded them lodging in the al-Aqsa mosque near the Dome of the Rock, the original site of the Temple of Solomon. The timing of the founding of the Knights Templar was critical. A group of seven hundred pilgrims had been attacked on the eve of Easter 1119. Three hundred were brutally massacred. Sixty more were taken prisoner, and all the possessions of the group were seized as booty. Despair swept through Jerusalem. The establishment of the Order was a prerequisite for the continued survival of Christendom in the Holy Land. The Hospitallers, or Order of the Hospital of Saint John of Jerusalem (now the Knights of Malta) had been established around 1080 as a charitable group to provide medical care and shelter for pilgrims and had received papal recognition in 1113. During the 1130s, the Hospitallers became involved in military activities, although militarism was never the exclusive province of the Hospital as it was of the Temple. Jerusalem was virtually isolated from the rest of the European holdings in Palestine. Though symbolically and emotionally of the greatest importance to Crusaders, the city was surrounded by Muslims and in constant danger of attack. It was ruled jointly by the Patriarch of Jerusalem, the Latin king, and whichever particularly powerful crusading feudal lord might be in the area--a politically unstable situation that often led to breakdowns in communication and conflicts of interest. The dangers to pilgrims were manifold as there was little control of the route between the port of Jaffa (modern Tel Aviv) and Jerusalem, some thirty-five miles as the crow flies--a two-day journey along a dangerous mountain road through fierce desert heat and arid terrain, surrounded by brigands, Muslim armies, and wild animals such as lions. The Holy Land endured a chronic shortage of stable military manpower. The port cities of Palestine were the only real centers of economic activity. Merchants from the Italian cities of Genoa, Pisa, and Venice conducted a brisk Mediterranean trade. The desire of King Baldwin I to build up the Western population of Jerusalem as a safeguard against the surrounding Muslim enemies motivated him to provide economic incentives to encourage people to move there. The young Order was particularly vulnerable to any number of problems. The knights, having pledged themselves to poverty, wore secular clothing donated by the faithful. Their seal shows two knights riding a single horse, emblematic of the vow of poverty and their humble origins. Their quarters were described as somewhat dilapidated by a contemporary historian. Yet they were growing. Saint Bernard, who rose to become the most influential and politically powerful Catholic theologian of his time, took a deep interest in the fledgling Order. Bernard was the nephew of André de Montbard, one of the original knights of the Temple and later a Grand Master. Bernard was a member of the Cistercian Order and was chosen to be the first abbot of the Monastery of Clairvaux. In 1126, André de Montbard and a Templar named Gondemar left Jerusalem for Europe. Baldwin II had written to Bernard, asking for his help in getting papal approval for the Templar Order and crafting a Rule to guide Templar conduct. Hughes de Payens traveled to Europe shortly thereafter to recruit new knights, solicit donations of land and money, and spread the word of the Order’s works. Bernard was of enormous help to the Templars. He was uniquely qualified to synthesize the concept of a knightly religious order. Born in 1090, he had grown up intending to become a knight until he experienced a religious conversion at the age of twenty that forever changed his life. At age thirty-six, Bernard was approaching the height of his power. While chronic ill health made him physically frail, he radiated an immense spiritual vitality. His personal influence on the twelfth-century Church is incalculable by modern standards. He literally functioned as the conscience of Christianity. That which he supported flourished, that which he condemned withered. His energetic support of the Templars practically guaranteed their success. Bernard had become a Cistercian monk in 1112, when the brotherhood was on the verge of failure. In 1115, at the age of twenty-five, he was chosen to become the superior of Clairvaux. Under his leadership the Cistercians grew from seven abbeys in 1118 to 328 in 1152. He was an extremely talented organizer who had a particular skill for hierarchical organization and the efficient structuring of power. He applied this skill to the Templars. "History is the blended story of individuals, issues, and the times in which they existed. 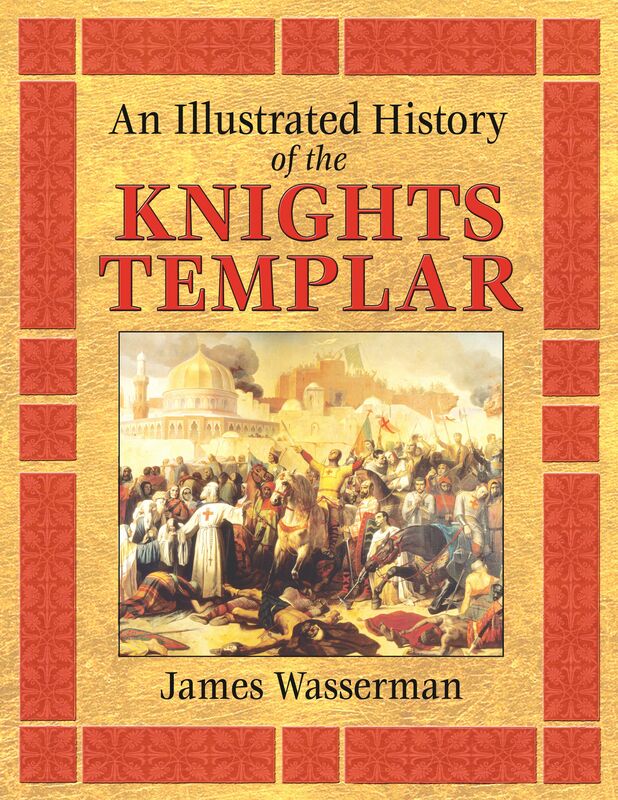 Wasserman has done an excellent job of defining the times of the Knights Templar, the political climate, the position of the Church, as well as giving us the background of the men that were involved in the tradition." ". . . this book sets an excellent foundation for research and understanding of this tradition." ". . . one of the best illustrated and most honest accounts of the Templar. . . . this is an exciting read and a 'must have' for any bookshelf." ". . . scholarly, yet accessible. . . a fascinating read." "AN ILLUSTRATED HISTORY OF THE KNIGHTS TEMPLAR makes the most of visuals from all centuries and is a recommended pick for any new age collection, even those who already have several books on the topic. Little is duplicated, here."